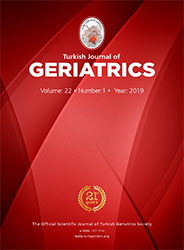 2Dokuz Eylul University, Faculty of Medicine, Department of History of Medicine and Ethics, İzmir, Turkey DOI : 10.31086/tjgeri.2019150579 Introduction: The aim of this study was to determine attitudes of research assistant physicians towards the elderly in a university hospital and to evaluate the association of sociodemographic and occupational characteristics with ageism. Materials and Methods: In this descriptive study, the target population comprised 521 research assistant physicians who worked at the internal medicine and surgical clinics of the university hospital between December 2014 and March 2015. Variables considered in this study included demographic and occupational characteristics and attitudes towards the elderly. The Ageism Attitude Scale (AAS) was used to identify the physicians" attitudes towards the elderly. The data were collected using the sealed envelope system. Results are presented as percentage distribution and mean. A t-test was used for statistical analysis. Results: A total of 327 physicians were included in this study. The total mean score obtained from the EDAS was 86.9±8.0, with a score of 37.4±3.8 for the Restricting the Life of the Elderly dimension, 30.2±4.3 for the Positive Ageism dimension and 19.3±3.1 for the Negative Ageism dimension. No significant difference was observed between the mean attitude scores in terms of sociodemographic and occupational characteristics (p>0.05).